Welcome! We're excited to help you explore your thoughts about joining the Catholic Church. Perhaps a major life moment such as an engagement, marriage, or the arrival of a child has caused you to be come interested in knowing more about the Catholic Church or Catholic belief and practice. Maybe you want to learn about the process of becoming Catholic. No matter thecase, we're happy to help assist you in this process. Please remember at any point during this process you may change your mind. We welcome you and hope that the information contained here will provide answers to some of your questions or offer pathways to help you continue your inquiry. If you have a friend, family member, co-worker or someone else in your life who's a practicing Catholic, you might begin by asking them a few questions. I think I want to become Catholic, what should I do? The first step in the process is to get connected with a local parish. Ask Catholic friends and neighbors about their parish. Visit parishes near your home. Go to Mass and talk with other parishioners. Priests will be happy to talk with you about becoming Catholic. However, please remember that Sunday is a very busy time for them and it may be best to make an appointment to see them during the week. If you decide that you want to become Catholic, you will participate in a process called the Rite of Christian Initiation of Adults, or RCIA as it is sometimes referred to. In RCIA you will learn about the teachings of Jesus as the Catholic Church has handed them on. You will also participate in the life of the parish through service and prayer. If you have not been baptized, the Christian initiation process prepares you to become a Catholic Christian through the sacraments of: baptism, confirmation and the Eucharist. 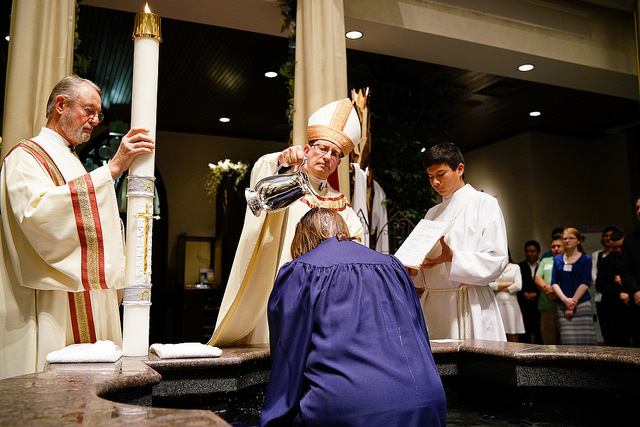 If you have been baptized in another Christian church, the Christian initiation process prepares you for full communion with the Catholic Church by celebrating the sacraments of confirmation and the Eucharist. If you were baptized Catholic as an infant but have not celebrated the sacraments of confirmation and the Eucharist, the RCIA program would be appropriate for you. If you are an inactive Catholic, one that has celebrated all the sacraments of initiation, and would like to return to active participation in a parish, we welcome you and celebrate your desire to take another look. Please contact a parish staff member at a Catholic Church near you about how to return to the Church. How long does it take to become Catholic? At least one complete liturgical year. Please keep in mind, the process takes as long as is necessary for each individual person to come to conversion. The bishops of the United States in the National Statutes for the Catechumenate have stated that the time spent in the catechumenate proper should be at least one liturgical year so catechumens can experience the elements of one full liturgical year, which is necessary for complete catechesis, and have enough time to apprentice into the community faith and life (RCIA, 75). Seeking information about the Catholic faith will not commit or oblige you to become Catholic. We encourage you to learn as much as you can and want to know about the faith and take as much time as you need to make this decision. While we love the Catholic faith, and hope that you will also come to love it, we will not pressure anyone to make such an important decision.